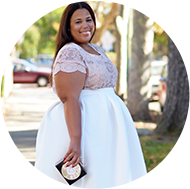 The requests for plus size formal-wear and prom looks have been getting crazy. I didn't realize people had such fancy places to go. I, on the other hand, rarely get to go to fancy enough events that would require a gown. I need someone to invite me to something. LOL. Anywho, I've scouted out a few places that you may or may not know about. A lot of the places mentioned do have a combination of prom, evening, and mother of the bride, so make sure you look around each site. David's Bridal - This seems like an obvious choice, but I just visited this store and spoke with an employee. She told me that prom gowns would be arriving now until the end of March. I saw some gowns, including this chevron striped gown on the photo, which I wouldn't mind having in my arsenal in the case that a special occasion comes up. It is a dead ringer for an Oscar de la Renta gown from a couple of seasons ago, but without the price tag. Unfortunately, it's not set to arrive until late March. Sydney's Closet - This site has some excellent prom selections and formal-wear pieces. They specialize in plus sizes and carry up to a size 44. Nordstrom - The Nordstrom special occasion dresses are more suited for adult formalwear and mother of the bride. The selection didn't have good selects, in my opinion, for prom. Rent The Runway - A lot of the time when we buy formalwear it generally is a gown that is only worn once. "Rent the Runway" provides an option that allows you to rent high-end garments for a fraction of the price. Check out the accessory department as well. They have fancy clutches and jewelry from some of the priciest designers. SimplyBe - This is not a place to traditionally find formalwear, but Simply does offer quite a few long dress options. Fame & Partners - Update* - I was just sent this by a reader. I don't know much about the site, but the dresses look trendy, edgy, and youthful. This would be a great choice for prom goers. Check bridesmaid dresses for your formalwear. I am the queen of wearing things in a way that the designer never intended. Look for those bridesmaid dresses, you never know what you could find. Particularly, there are dresses from the designer collaboration at David's Bridal (Vera Wang & Zac Posen) that I would totally wear to a formal event. There is no shame over here. Beware of the some of the overseas online dress shops. I have seen internet disasters too many times, where people order from these sites, and the dress is pictured one way and comes to your house all jacked up. LOL. I, myself, ordered from one of the sites. The best of these sites is Light in the Box. I've ordered, and while I didn't feel the dress looked as great as it did online, it was still pretty identical. I've only ordered one time, so I don't know how the other dresses look, but mine came out okay. Now, I'm not too confident in the return systems, so if you purchase a dress here, you will want to be prepared to keep it. If ordering online you may want to order a few dresses at one time. If you are strapped for time then I would order a few dresses at one time and figure out which one you want to keep. Make sure you know the return policies before you do this. Be prepared to get your dress altered. Formalwear almost always needs alteration. Budget for that. Depending on what is needed you could pay an addition $50 to $100. Give yourself a lot of time to shop - Y'all know how I feel about last minute shopping. Why stress yourself out if you don't have to. Give yourself 1 to 2 months to find your perfect look.